Pentek R50-BB water filters produce healthier, better-tasting drinking water. The Pentek R50-BB filter cartridge pleated design maximizes dirt-holding capacity. The Pentek R50-BB water filter is versatile and reusable, allowing for a variety of uses. The Ametek R50-BB Sediment Water Filter is manufactured from a durable, non-woven and reusable polyester fabric that is suitable for a wide range of filtration uses. 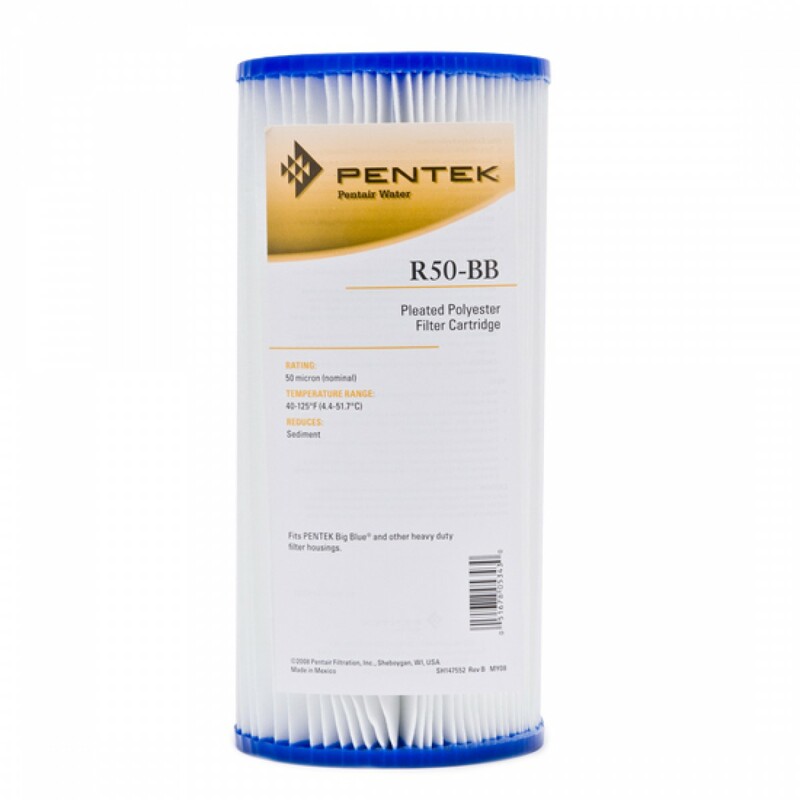 The Pentek R50-BB water filter media is pleated around a polypropylene core for added strength and the ends are immersed in a thermosetting vinyl plastisol. Embedding and sealing each end of the pleat in this fashion fuses the three components together forming a unitized end cap and gasket. The overlap seam is sonically welded to reduce internal bypass improving filtration efficiency. R Series filter cartridges are resistant to both bacteria and chemical attack making them suitable for a variety of residential, commercial and industrial applications. NOTE: Do not use with water that is microbiologically unsafe or of unknown quality without adequate disinfection before or after the system. 50 micron Pentek R50-BB Pleated Polyester Water Filter Cartridge. 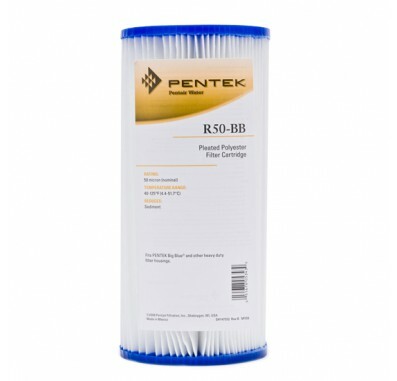 The Pentek R50-BB replacement filter cartridge has durable polyester media that is bacteria and chemical resistant. The R50-BB filter can be used on chlorinated or non-chlorinated water supplies. The Pentek R50-BB filter cartridge media is pleated to maximize dirt-holding capacity and extend the time period between changes or cleaning. 155053 Culligan R50-BBS filter fits in housings for 10 inch Big Blue water filters.